Arefpour, A., Shafierad, A., Monshi, A., Saidi, A., Monshi, M. (2015). The Impact of MnO, Li2O, ZnO and TiO2 on Mold Powders Viscosity Using Hot Stage Microscope Analysis. International Journal of Iron & Steel Society of Iran, 12(2), 39-45. A. R. Arefpour; A. Shafierad; A. Monshi; A. Saidi; M. Monshi. "The Impact of MnO, Li2O, ZnO and TiO2 on Mold Powders Viscosity Using Hot Stage Microscope Analysis". 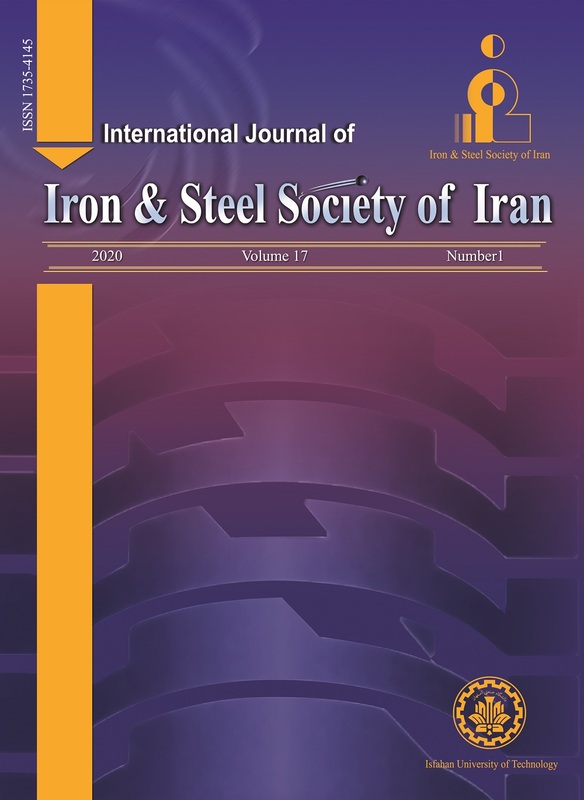 International Journal of Iron & Steel Society of Iran, 12, 2, 2015, 39-45. Arefpour, A., Shafierad, A., Monshi, A., Saidi, A., Monshi, M. (2015). 'The Impact of MnO, Li2O, ZnO and TiO2 on Mold Powders Viscosity Using Hot Stage Microscope Analysis', International Journal of Iron & Steel Society of Iran, 12(2), pp. 39-45. Arefpour, A., Shafierad, A., Monshi, A., Saidi, A., Monshi, M. The Impact of MnO, Li2O, ZnO and TiO2 on Mold Powders Viscosity Using Hot Stage Microscope Analysis. International Journal of Iron & Steel Society of Iran, 2015; 12(2): 39-45. The aim of conducting this research was to evaluate the viscosity change in the continuous casting of steel mold powders by altering their chemical compositions, using hot stage microscope analysis. 4 low-fluorine samples containing such compositions as MnO, Fe2O3, Li2O, TiO2 and ZnO, as well as another fluorine-free sample containing a combination of Fe2O3 and TiO2, were prepared in this research. The viscosity of the reference powder (the mold powder applied in high-speed continuous casting in steel industry), as well as the viscosity of the above-mentioned samples, was evaluated using hot stage microscope analysis. The results of hot stage microscope analysis revealed that the viscosity of the reference powder was similar to that of low-fluorine and fluorine-free samples. Finally, a fluorine-free sample containing a combination of Fe2O3 and TiO2 was introduced as an optimized composition which could be a substitute for the currently-used mold powder applied in the continuous casting of steel with high speed, considering its similar viscosity to be that of the reference powder. ISIJ Int., 45 (2005), 1051. Slags Fluxes and Salts, The South African Institute of Mining and Metallurgy, (2004). K.C. Mills and A.B. Fox: ISIJ Int., 43 (2003), 1479. P. Scheller: The South African Institute of Mining and Metallurgy, 411-415 (2004). W. Wang, K. Blazek and A. Cram : Metallurgical and Materials Trans., 39B (2008), 66. K.C. Mills and A.B. Fox: Dept. of Materials, Imperial College, ( 2002). A. Yamauchi, K. Sorimachi and T. Sakuraya: Ironmaking and Steelmaking., 29 (2002), 203. A. Nowak and R.A. Bialecki: Institute of Fluid Mechanics and Heat Transfer EUROTHERM 82, Gliwice-Cracow, (2005). G. Wen, S. Sridhar, P. Tang, X. Qi and Y. Liu: ISIJ Int., 47 (2007), 1117. S.Y. Choi, D.H. Lee, D.W. Shin, J.W. Cho and J.M. Park: J. Non-Crystalline Solids., 345&346(2004), 157. X. Qi, G.H. Wen and P. Tang: J. Non-Crystalline Solids., 354 (2008), 5444. C.A. Pinherio, I.V. Samarasekera, J.K. Brimacombe: J. Iron and Steelmaker., (2004), 56. J.Y. Chung: J. Materials Science Forum., 561(2007), 3. M. Nakamoto, Y. Miyabayashi, L. Holappa and T. Tanaka: ISIJ Int., 47 (2007), 1409. M. Nakamoto, J. Lee and T. Tanaka: ISIJ Int., 45(2005), 651.